I wanted to read this book as soon as I heard about it. I finally got it a little over a month ago and waited to read it, mostly because the size of the book is intimidating. I should have known I would love it though because it is a Cassandra Clare book. I so love the shadowhunter world, why can't I be a shadowhunter? I can see myself running around throwing knives at demons. 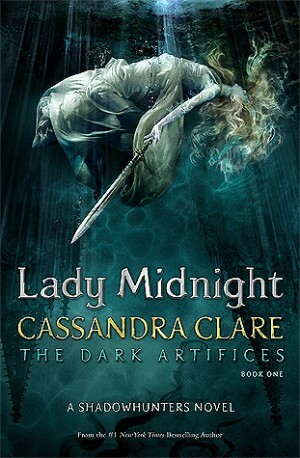 This book takes place five years after the dark war, which happened in the last book of The Mortal Instruments series. I really liked how some of my favorite characters had a scene or two in this book, like Clary, Jace, and Magnus. I also liked the little story at the end of the book, after the epilogue. There was so much about this book that I liked and I am so ready for the next book to come out. Emma was a great female lead. She was snarky, witty, and strong, pretty much everything you need in a lead. I'm not sure how I feel about her and Julian though. I liked them at first but after hearing more about the whole parabati thing, I'm wondering how Cassie Clare is going to go about their relationship. Also, why she would play with my feelings like this. I really don't think there was a character that I didn't like in this, even Malcolm was liked. There were some plot twists that I didn't see coming at all and made me gasp. Especially, that thing at the end with Kit. I did not see that coming, at all.